MCC has been granted planning permission by Westminster City Council to redevelop the south-western corner of Lord’s. 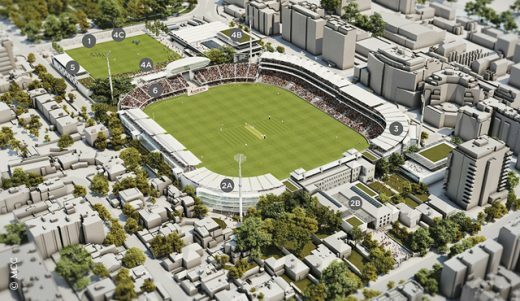 The South-Western Project, which also includes a new Thomas Lord building and a new Tavern Pub, is phase two of the Masterplan for Lord’s. The earliest that work will begin on the project in its current form will be autumn 2019, due to the need for Lord’s to be free of building works that summer for the ICC Cricket World Cup. Single-shell aluminium semi-monocoque structure prefabricated in 26 sections off-site in a West country boatbuilder’s yard and assembled at Lord’s Cricket Ground. Future Systems was run by Jan Kaplicky and Amanda Levete. For years they designed visionary buildings with little to show, but then they had a starkly modern house built in northeast Islington and then rose to fame with their Lord’s Cricket Ground Media Stand. This was criticised for looking space age but being made using old-fashioned, slow techniques in a Cornish boat-building yard. Nevertheless Future Systems have certainly pushed the boundaries of English architecture, indeed building design globally.